WP2FP will show you how! In about 30 minutes, this easy to follow video course will show you..
How to create a Facebook App. Tap Into Facebook’s Millions of Daily Visitors! The benefits of being able to tap into the traffic that is on Facebook every day (2 BILLION) should be obvious. But the cost and the technological know-how required to effectively benefit from the millions of people visiting Facebook every day can quickly go beyond the reach of most small businesses. One way to put your offer (or offers) in front of the Massive amount of Daily Facebook Visitors is with a Facebook Page. You can further increase the power of your Facebook Page with Facebook Applications which can add more features and more functionality to your Page. The Good And Bad Of Facebook Applications! Adding Facebook Applications can be easy when you use 3rd party services BUT..
You then have to hope those 3rd party services stay in business, and that they do not screw up your Facebook account. The more secure and long lasting alternative to these “easy” 3rd party services, is with the Facebook Developer service BUT..
Learning how to use the Facebook Developer service can be a huge challenge, to say the least, and getting your questions answered with their support service or reading through the “helpful” documents, isn’t always helpful (or fast). How Do I Set Up A FREE SSL Certificate? You also need to have an SSL Certificate assigned to any URL you are using within your Facebook Application. Getting and setting up an SSL certificate adds an entirely new set of challenges. If you do not know what you are doing, you can choose the wrong type of SSL certificate or spend way to much money on having someone else set up what you were told was the correct SSL certificate. That is one reason I’m proud to bring you WordPress To Facebook Pages. A complete course that details how to.. These video guides provide you with detailed ‘Over-The-Shoulder’ style step-by-step tutorials that covers everything you need in order to install your full WordPress site into your Facebook Page & will leave no technical stone unturned. WordPress to Facebook Page Video Series! Video 1 Running Time 3:38 – This video will introduce you to the WordPress to Facebook Page series of training videos. In addition to the WOW Factor of having your entire WordPress site installed inside your Facebook Page, you will discover how to create a Facebook Application and even how to add the power of https to your URL – ALL FOR FREE! Video 2 Running Time 3:37 – In video two we will cover the preparations of getting your WordPress site ready to properly display within your Facebook Page. Video 3 Running Time 3:37 – This video will cover the very basics of how to setup your Facebook page. Video 4 Running Time 3:52 – In this video we will cover the different types of SSL certificates. There is Good FREE & Bad FREE SSL options and I explain all in video 4. Video 5 Running Time 4:23 – Video five is part two of setting up our FREE SSL service. In this video, I’ll cover the added benefits of using this FREE SSL service as well as going over the possible issues that might pop up AND how to fix them if they do. Video 6 Running Time 5:17 – Video six is part three of setting up our FREE SSL service. Now that we have the SSL activated and working on our WordPress site, there are a few items that need our attention. I demonstrate the items that are not yet working and then go through the steps to get them working, as you watch each step! Video 7 Running Time 3:36 – In this video I show you a couple ways to force browsers to display your https URL instead of the old http URL. As a safeguard, I also cover how to fix your WordPress site in case something goes wrong when you try to force the SSL version of your URL. Video 8 Running Time 3:16 – This is part one of the six part segment on creating the Facebook Application required to install WordPress into our Facebook Page. In this video we create our Facebook Developers account. Video 9 Running Time 3:09 – In this video, part two of creating the Facebook App, we create the application by giving it a name, configuring the settings and covering the required & not really required WordPress pages. Video 10 Running Time 2:54 – We are in the home stretch and this video is part three of creating our Facebook App. In this segment we generate the code required to add to our WordPress site AND add it to the site. Video 12 Running Time 3:28 – Now that we’ve got everything working the way it should, we will now cover a couple of customizations you may want to do – AND not want to do. Video 13 Running Time 2:36 – Since there is no big red DELETE button, I wanted to show you how to remove the app in case you ever find a reason to do so. When you download, watch and apply what you’ve learned from these WordPress to Facebook Page How To Video Tutorials, it’s virtually impossible to fail! [Private Label Rights] – These 4 videos (plus the intro video) will show you what to, & not to do in order to boost the traffic to your Facebook Page. Comes with the added benefit of PLR so you can re-brand them or pass them on as-is, to your own customers. [Private Label Rights] – These 4 videos (plus the intro video) will show you some Facebook advertising secrets that will increase your FB advertising return on investment (ROI). [Private Label Rights] – These 4 videos (plus the intro video) will show you how to maximise your CPA (cost per action) income by using the power of Facebook Ads. [Master Resell Rights] – Facebook Powerhouse is over 30 pages of tips and ideas on how to generate traffic to your offers (and websites). Since your Website is installed into your Facebook Page, the traffic that Facebook Powerhouse helps you generate, will not have to go very far to get to your offers! 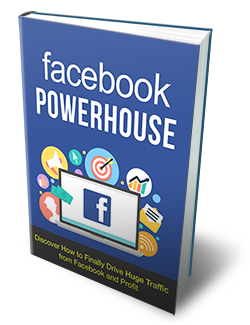 Facebook Powerhouse comes with Master Resell Rights so you can pass on the resell rights to your customers for extra value. “The content is great and so is the presentation. Clean, concise and easy to follow are all things I think of when watching these tutorial videos…” – Corey B. “Not only were his videos of excellent quality, but his step by step instructions, clear teaching method and comprehensive coverage of the topic in question were fabulous…” – Danette H.
“Steve Emulates What Customer Service Is All About…” – Allen L.
But Which Version Is Right For Me? Since I am the creator of these videos, I am in the unique position to offer you something special. I am the only person legally able to offer you both Personal Use Rights or a Brandable Resell Rights (White Label PLR) version. 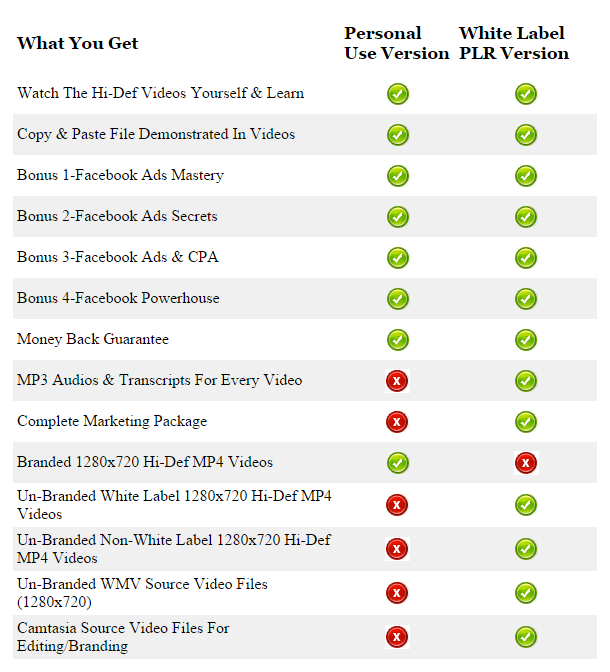 Both options offer the exact same videos but the White Label PLR (Brandable Resell Rights) version allows you to edit as much (or as little) as you may want and resell as many copies as you want for 100% profit. If you have no idea what Brandable Resell Rights is then it is a simple choice – you want the Personal Use Rights version. 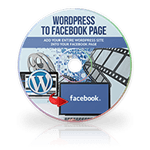 Okay..So How Much Is This In-Depth WordPress Site To Facebook Page, Video Course Going To Cost? When you take action right now, your WP2FP Video tutorials will be available for instant download so no waiting to begin creating your Facebook Pages using your WordPress Site! For a single payment of $17.00 for the Personal Use Rights version or a single payment of $37.00 for the White Label PLR version, you will have instant access for an entire year to these training videos! When you invest in these WordPress Site To Facebook Page Video tutorials, you will have a full 30 days to review the videos and ensure your satisfaction. 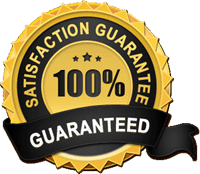 Remember, whether you get the Personal Use or White Label PLR Version your decision right now is protected by a 30-Day Money-Back Guarantee so you have NOTHING to lose! 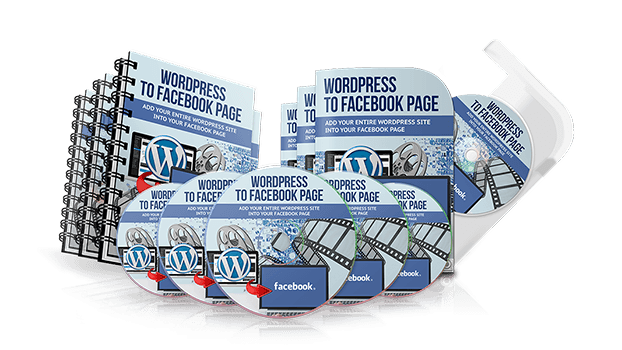 WP2FP | WordPress To Facebook Page Video Training Course! All 13 Training videos in Hi-Def 1280×720 MP4 format for easy offline viewing, when you download them to your personal computer. All four BONUS Products that will help me generate traffic to my WordPress site installed into my Facebook Page. The custom Copy & Paste file demonstrated in the training video. All four BONUS Products that will help me generate traffic to my WordPress site installed into my Facebook Page. You also receive PLR and MRR to these as mentioned earlier. The MP3 Audio files from ALL 13 training videos. The Transcripts from All 13 training videos. Complete Marketing Package to help you resell the training videos (includes sample video, minisite, graphics…). Unbranded 1280×720 WMV video format for All 13 training videos. You Can Re-package Into Multiple Products. Sell The FREE SSL Setup As Its Own Product! P.S. Remember your purchase of the WP2FP video tutorials are covered by my 30 day, 100% money back guarantee – so you risk nothing if the videos do not live up to your expectations. nor do they endorse these products.